MERCERVILLE, Ohio — Some signs of growth. 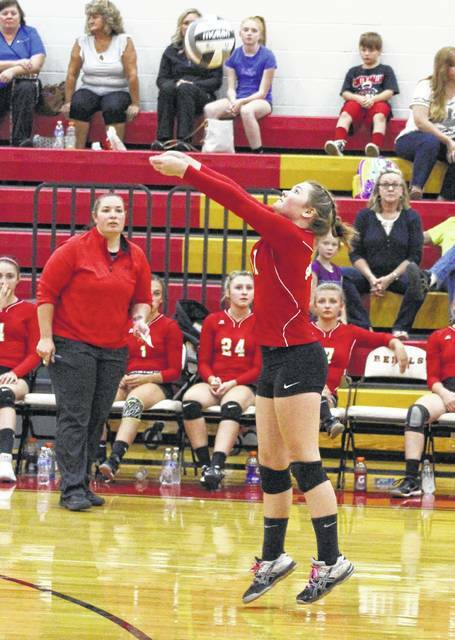 The South Gallia volleyball team is still winless, but the hosts put together three spirited games on Wednesday night during a 25-13, 30-28, 25-15 setback to Symmes Valley in a non-conference match in Gallia County. The Lady Rebels (0-5) started well after building a 6-1 advantage in the opening game, but the Lady Vikings (4-3) rallied with 10 straight points that seemed to take the wind out of the hosts’ sails. SVHS went on to win 19 of the final 31 points en route to a 12-point win and a 1-0 match advantage. Game 2 was the gem of the night as both squads battled through a dozen ties and 13 lead changes, and neither team led by more than six points the entire time. After SGHS built a 15-13 lead, the guests rallied to build a lead as big as 23-17 — but the Lady Rebels answered by tying the game at 23-all. Both teams traded points out to 26-all, but the hosts had their opportunity to win the game after taking leads at 27-26 and again at 28-27. Both times, however, South Gallia hit its serves out of bounds — allowing the Lady Vikings to take service with a 28-all tie. Symmes Valley ultimately scored the final two points and claimed Game 2 by a 30-28 margin, giving the guests a 2-0 match lead. SVHS never trailed in Game 3 after bursting out to a 4-0 lead en route to a 19-7 cushion, but the Lady Rebels answered by closing to within 19-11 before ultimately running out of time in the 10-point setback. The Lady Vikings also won the first contest between these two teams back on Aug. 24 by a 3-0 count in Willow Wood. Despite the loss, SGHS coach Sarah Shirley was very upbeat about her troops and the way they performed. “We played this team two weeks ago and they beat us pretty quickly, but tonight we did a lot better job of communicating and playing together,” Shirley said. “We still had moments tonight where we got frustrated and stopped doing those things, but we did learn how much better we can be when we communicate. If we can continue to work together through the tough times, we will have some more positive results to show for it. Christine Griffith led the Lady Rebels with eight service points, followed by Kara McCormick with seven points. Erin Evans, Amaya Howell and Aaliyah Howell also contributed three points apiece in the losing effort. Rachal Colburn led the SGHS net attack with five kills and seven blocks, while Aaliyah Howell also chipped in five kills. Evans added two kills and a block, with Griffith recording a kill and four blocks. Taylor Webb and Ericca Ross led the Lady Vikings with 11 service points apiece, followed by Kinley Patterson with eight points and a team-best 11 digs. Savannah Webb led the net attack with 13 kills and Kaitlyn Crabtree added a dozen kills for the victors. 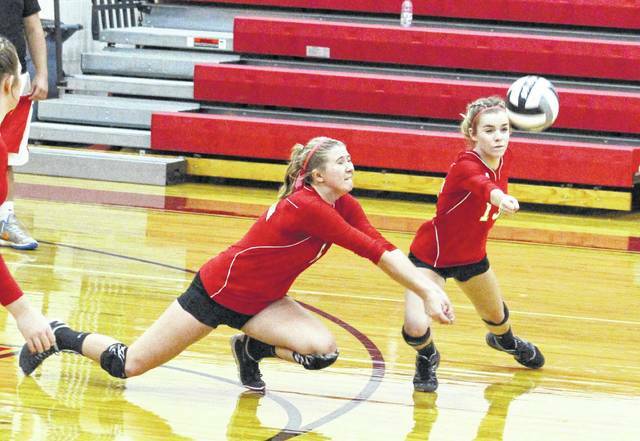 South Gallia junior Rachal Colburn, left, and sophomore Kara McCormick both dive for a dig attempt during Game 3 of Wednesday night’s non-conference volleyball match against Symmes Valley in Mercerville, Ohio.